As a bear maker what do you collect in your 'stash' ? I was clearing out things from my bear room and kept finding things I had forgotten I had bought. Like old dolls clothes and little shoes , baskets and bits of vintage jewellery. This is the result of my many Saturday Morning Treasure Hunts. I am a terrible hoarder of things that I might find a use for and I still search for more even though I have cupboards of it. I have enough fabric to start a shop but I never seem to have just the right one so I get more. My main focus of hoarding for my stash of treasure is doll clothes, and vintage doll paraphernalia that might work for teddies, hat flowers, bonnets, bibs, ribbon that type of thing really inspires me. So that's my secret out. What do you collect or do you just buy what you need? I too collected a bunch of doll and baby clothes over the years. I just cleaned out my cabinets and sold a lot of them last night on ebay. So many of them just woulnd't work for me, size wise that is. I collect fabric, especially tiny prints. It is hard to find that, so whenever I see it I buy it. I love wool or wool blend felt, I use a lot of it, so I have collected a nice pile of colors. I have a huge supply of embroidery floss, to decorate the felt with. Yarns, I have a huge stash of fine weight yarns for scarves and things. Leather, I live near a fabric store that sells scraps in big bins, so every time I go I did through the bins. Beads, tons of them. Buttons too, I love them with the felt. Loose wool, alpaca and mohair, I have so much, but I seem addicted to it. I buy it raw and clean and dye it. Silk flowers, and leaves, and berries, they find their way onto collars. Ribbon and lace. Of course mohair fabric. I love all kinds of crafts, and I keep a huge amount of general crafting material around. 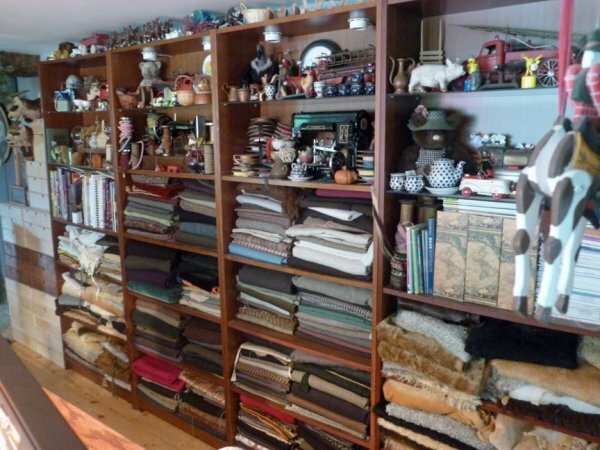 I am not afraid to admit I am a hoard of that stuff, I think any good crafter is. Feathers, clay, corn husks, it all finds their way into the bears sooner of later. It is nice to just to be able to bear shop right from the cabinets. I have most things jammed into a small room but there is a LOT! Ribbon(never have the right one though), fabric( as I make most of the clothes for my creations), beads, brass findings, buttons, and notions. I have a container of doll clothes and one labeled props. You never know when you might need a miniature pinwheel or bucket. Oh, lace and trims. I'm always very excited when I find vintage lace at yard and rummage sales. Books on how to make things...good for referencing. One container full of wool felt and one full of ultrasuede and leather. Of course, also in this small room is my doll collection, my bear collection and assorted other knick knacks. Ahem. Jenny, you've brought up a topic that will reveal one of my many weaknesses . . . hoarding of sewing/crafting supplies. But looks like I have some very fine company with the same tendency. I not only have tons of bearmaking supplies (most of it mohair), but quilting fabric/patterns and supplies needed for many different craft genres that I've been interested in over the years. And I don't buy just enough stuff to cover one or two projects . . . I buy enough items for each crafting idea to last the rest of this life and into the next. So storage for all of this has become a major problem which leads to not being able to find what I know I've bought before, then having to go out and purchase again. If I could only get motivated to clean up my work room . . . . . . . .
At least it's neatly organized! But when you're feeling a lack of inspiration, it's wonderful to go to the stash and play for a while- something inevitably jumps out at you saying make me make me! I've also been having a good clear out of my bear room - I'm not really a hoarder so now and then I do love a good clear out - tidy up and organizing everything again So what's in my stash....lots of mohair, dyes, ribbons, flowers, clothes, hats, fabric, buttons, charms, bells, pins, lace & trims and vintage/antique bits and pieces. It's a good place to play and get inspirations I love old and worn things and do enjoy a rummage in some of the charity stores - there are no antique places where I live. I have seven tubs of mohair, far too much but wonderful to go through for insbearation. pun intended. Also eyes, joints, feather fabric for bird wings, ribbon, and 25 pounds of polyester fiberfill. Wow...I am not alone. Photo props ...yes that is me as well. I bought a mini fireplace...solid stone with an iron grate for £4 ... ( vintage salesman sample from the 1960s I think) it's 14" high and made my brother carry it round a car boot sale...never used the thing yet! It's cool though...may come in handy at Christmas! I fit right in with the rest!!! About 15 years ago we remolded our kitchen and all of the old cabinets now reside in my sewing room and they are stuffed to the hilt! I even have a hard time throwing away some really neat food tins and plastic containers because someday I just know they will come in handy! I have all the usual assortments already mentioned of ribbons, flowers, buttons and such, not to mention about every hand and sewing tool you could think of! When I start a project, every thing is neat and put away in all the proper places. When I am finished with the project, it looks as if a bomb was dropped in my sewing room, which is very small, and there is only a tiny walk way thru! It takes me a couple of days to put it all back so I can start all over. I wish I wouldn't do that Ah well, when the creative juices start.......! Add one more to the list. I can't help collecting vintage jewelry, flowers, ribbons, buttons, books....I also collect all kinds of fur coats found at yard sales over the years. I have more than I can ever use in a life time to make my bears. One can never have too much space for our beloved treasures can we? I've collected lots of mohair & plush over the years. Lots of upholstery velvets for my mini's. More than I'll eve use. A couple of years ago I bought some vintage furs. Also collect little Knick / Knacks to display my mini's ie little boxes & chests, I used to make music boxes to sit the mini's on , so I was forever looking for little ornaments to display the bears with. Dollhouse miniature stuff worked well.